Wörrstadt (renewablepress) - Juwi´s award winning solar hybrid project at Sandfire Resources DeGrussa Copper/Gold Mine has been successfully operating for more than one year. The DeGrussa Solar Project is the world´s largest Off-grid solar hybrid project for mining and has saved the mine several million litres of Diesel. The project was voted Project of the year 2016 during the Energy and Mines Magazine World Congress in Toronto at the end of 2016. 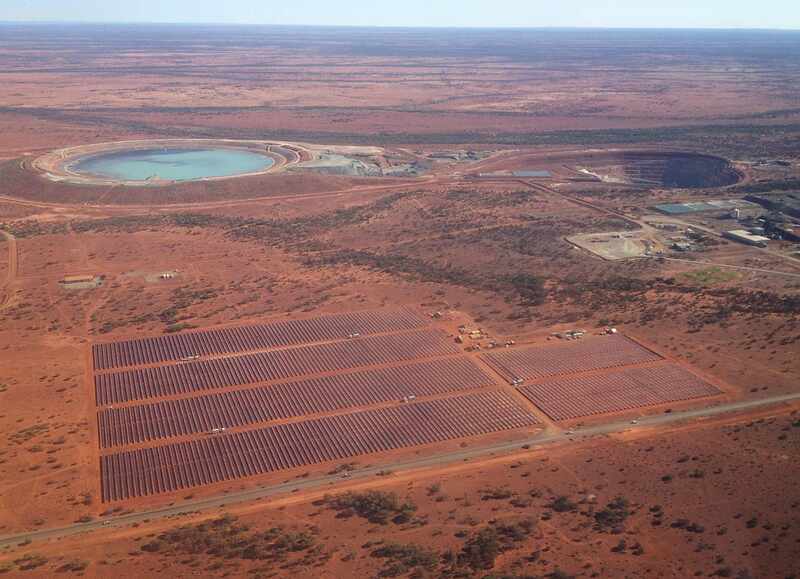 Over a year ago the world´s largest PV-hybrid-system, some 900 kilometers northeast of Perth (Australia), was successfully put into operation – now the mine owner and project partners report positive results. “For me as the electrical superintendent of Sandfire DeGrussa, reliability of power supply is of paramount importance for the success of our mining operations. Now after more than 1 year of operation I can confirm that the hybrid system is running smoothly, delivers substantial diesel savings and the power quality and reliability are as good or better than before.” Peter Gordon – Electrical Superintendent, Sandfire Resources. The hybrid system consists of a single-axis tracking 10.6 Megawatt (MWp) solar power plant coupled with a 4 Megawatt battery station utilising lithium ion storage technology. The innovative power plant supplements the existing 23MW diesel power station. Each month the solar power plant produces around 1.7 Gigawatt hours of climate-friendly electricity. This equates to a reduction of five million litres of diesel per year and simultaneously abates more than twelve million tons of carbon dioxide emissions. The system also provides tangible financial benefits to the mine operator. The system was designed and put into operation by the internationally renowned juwi group – a globally active project developer and EPC of wind and solar projects. “A mine powered by wind or solar energy reduces energy price risks and thus permanently increases the mine´s stock value”, Roth-Deblon emphasizes, who heads juwi´s Global Business Initiatives and as such is responsible for the development and implementation of hybrid systems. “The hybrid power plant at DeGrussa sets new standards and serves as a blueprint for a reliable and sustainable energy supply for industrial off-grid industries,” says Amiram Roth-Deblon. “The hybrid system at DeGrussa reliably delivers power to all site operations including ball mill, vent fan, pumps and diesel generator starting and stopping”, states Peter Drager, hybrid system specialist of juwi Australia. Already a year ago the off-grid-hybrid-system at DeGrussa was a hotspot for the international mining industry. It was awarded “Project of the year” at the global conference Energy & Mines World Congress 2016. Additionally many industry players visited the site in Western Australia. This year again, the project has been presented as a flagship project at Australia´s mining trade show Australia Summit Energy & Mines in Perth. In the coming months juwi will present innovative and robust power solutions for mines at various international events, such as Energy & Mines World Congress in Toronto (Canada) 27th and 28th of November 2017. The DeGrussa solar hybrid power system provides electricity to the DeGrussa mine of Sandfire Resources in Western Australia. juwi developed, built and integrated the hybrid power plant into the existing KPS Diesel power station. The project is owned by the leading French renewable power producer Neoen, with juwi providing O&M services. The Clean Energy Finance Corporation (CEFC) provided debt and the Australian Renewable Energy Agency (ARENA) provided recoupable grant funding. “The hybrid system is running smoothly, delivers substantial diesel savings and the power quality and reliability are as good or better than before.” Peter Gordon – Electrical Superintendent, Sandfire Resources. The juwi group is one of the world´s leading companies in the area of renewable energy. The renewable energy pioneer with a strong regional presence offers project development and EPC services as well as products and solutions for the energy turnaround. Company activities are mainly projects with solar and wind. The juwi group was established in 1996 in Rhineland-Palatinate/Germany. Since the end of 2014, Mannheim based utility MVV Energie AG has been partner and majority shareholder (63%) of the juwi Group. juwi has about 1,000 employees worldwide, branches on all continents and is actively engaged in various projects all over the globe. Working together with passion to implement renewable energy economically and reliably is what drives us. So far, juwi has realized more than 950 wind turbines with a total capacity of more than. 2,100 megawatts at more than 150 sites globally. In the solar segment, more than 1,600 projects with a total capacity of around 2,300 megawatts have been designed and constructed. Combined, these energy systems produce around 7.7 billion kilowatt hours of clean energy per year, equaling the annual demand of more than 2.5 million German households. Within the past 20 years, juwi has initiated an investment volume of around 8.6 billion euros to realize these projects.